When you wake up every morning at 6:30 AM, you don’t really have time (or energy) to accessorize and pile on pieces to your heart’s desire. Many of you may seem surprised that I still have to go to work as early as those of you who are employed at corporations. Even though I work for myself, I still leave the house at the early hours of the morning, hitch a ride with my sister on her way to work and get dropped off my atelier to start my full day of work, work and more work. Almost everyday, whenever I dress up, I tend to just grab and go. Well, actually more like I grab my phone, pick what I want to wear on my phone (since I photograph all my clothes) and show them to Erlindol (one of our household helps) then quickly run to the shower and prep. It’s always an amazing race at home. As you can see, on this day, it was an exceptionally quick race out the door. No layering. No fuss. It’s just a sheer top paired with a simple ruffled skirt. I took the first neon necklace I spotted, grabbed one gold ring, got the first bag I saw hanging from my cabinet and swoooooosh, out the door! I didn’t even have time to comb my hair hence the braid. Now, it looks like my hair style is just part of the styling! Haha! Since my hair was already in a braid, I thought of tying my buttondown in a knot instead of just tucking it inside my skirt. It goes well with the effortlessly sweet and charming hairstyle. It gives off a much more casual and carefree vibe, don’t you think? To make up some more for my lack of preparation, I tried to put more effort into my makeup as well. Instead of the usual no makeup look, I went for a bold colored liner and bright lips. Actually, I seldom apply makeup at home. I almost always put makeup on inside my car. That’s how much of in a rush I am every single day! can i have those shoes, please? I love your outfit! Have you ever blogged about your closet? I’m curious as to how you organize your clothes to maximize each piece since you like to play with your clothes a lot, wearing the same pieces of clothing but mixing them with others to create a totally different look each time. This is you in a rush? Is this one of those slow clap moments like when you flew to HK/Singapore? Sounds like a morning straight out of an episode of Amazing Race. Nonetheless, still looking comfortably fab. Haha yes! Slow clap! Thanks Mark! Thanks Kristina! My bestfriend took them :) I bullied her into taking them haha! Neon is love! 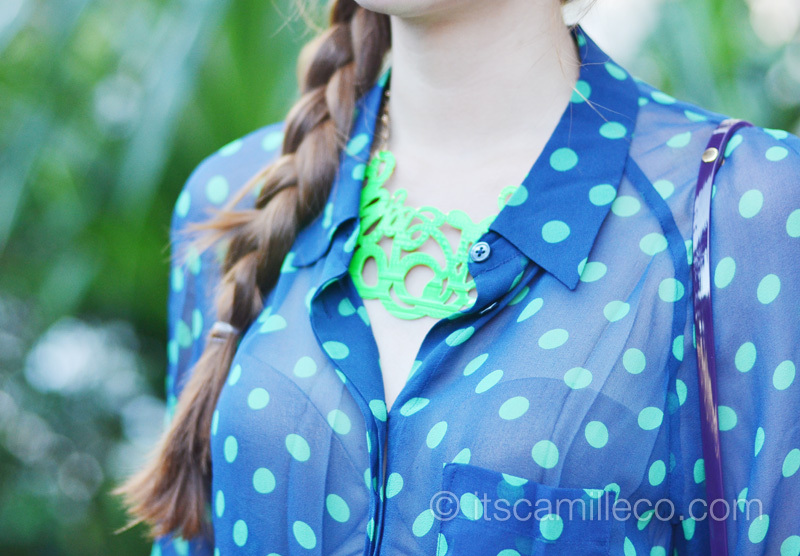 That neon necklace. (Awed). Hindi po halata na rush yung pagbihis. Haha. really love your outfit! sa dami ng damit niyo po sa closet nakakabilib na alam nio pa rin kung anung brand ito. amazing! please watch this video. no virus or anything. i just want everyone to watch this. share! hi camille… i hope you saw my last comment on your post… can give me an advice please? —– lurv ur outfit! i can feel na super comfy ka sa suot mu. and actually your right. instead of counting sheep’s, its better to visualize what you will wear the following day pwa di kana malulurkey maghanap ng susuotin…. Thanks Mica! :) Ninjang ninja! do they have Furla in Manila? Furla is a very expensive brand here in Europe.. This look is adorable! I love the polka dots! I read on one of your posts that you were on a trip to Phucket. Will you ever be creating a post about that? Your travel posts are always a joy to read and your photography is amazing! anyway ur really a huge inspiration to me..sa twing may mga esp occasion nga eh itong blog ko ung takbuhan mo .. Thanks Abing! :) Meet you soon! what it’s like in your daily basis? I’m surprise you wake up that early! care to share about your work and what it’s like working for yourself? and what’s the most important thing when working for yourself? I think discipline is the right word for me now..
Hi Camille! Really excited and curious about your new atelier! Will we be seeing some photos of it anytime soon? Best wishes! youre so chic… i love reading you’re blogs…….very fashionista..
You’re even more prettier when you smile. Nakalusot lang! :) Thanks Kathleen! Awww thanks Jhaycee! Hindi effortless yan but thank you! Oh really? :) Awww thank you Larissa! Thanks Lauren! You always notice the little things, which I love! Hahaha I thought no one else thought of taking pictures of all their clothes and turn it into a dress up catalog of some sort. totally effortless for something rushed! have a similar dilemma as well when rushing for work, its nice to know even fabulous fashion bloggers like yourself experience the same thing, makes styling more realistic :) btw, saw your pic with laureen and kryz in a beach in phuket, you guys look sooo flawless and sun-kissed..are you all wearing makeup? you still manage to look stylish even when in a rush… how do you do it? I love this outfit and I love your style!! love the look, the shoes are amazing <3__<3 and i love the print on the blouse ! Your such a pretty doll..!!! love everything your wearing. She has ninja skills too haha! :) Soon! I really love your blog. your styling is super cute. hahaha. how do you take care of your hair and what color is your hair? Thanks Kimberly! I just have treatments and use Pantene. :) No fuss! I have my hair dyed at Park Jun Salon so I don’t really know what the color is haha! Wow, you work so hard Ms. Camille! :) I really love this outfit, it’s so fun and easy to formalize. You look like a doll! I also noticed that your bangs are longer now! Will you be getting a new hairstyle soon? Thanks Kyla! :) Not anytime soon! I still like this haha!